I never thought I would get excited about writing the minute I got out of bed but now I can hardly wait until Mark is able to wheel me into the living room where Tobii and I meet every morning. I love writing and I love reading emails because those are the only two things I can do on my own. Every day I spend about three to four hours with Tobii but we don’t always get along and we’re constantly working on our differences to improve our typing methods. Tobii doesn’t like when light reflects off her screen and is sensitive to some vibrations so we are constantly moving to find the right spot in our home to hang out. If moving doesn’t help and I’m still struggling to type with my Eye Gaze machine we recalibrate my eyes which usually helps and I am back to writing again. It’s been almost a year since I started using my Tobii for blogging. Now it seems normal that I type with my eyes and not with my fingers. Who would have thought I would be typing with my eyes to communicate. Now it’s time for me to take the next step and use it for talking. I’m Shanna, a friend of Bryan’s and a Speech Pathologist. We met a few summer’s ago at the Tindall’s party out out in the boonies (Angie is my cousin). I’m so happy you are able to use your Tobii to continue to write your blog. 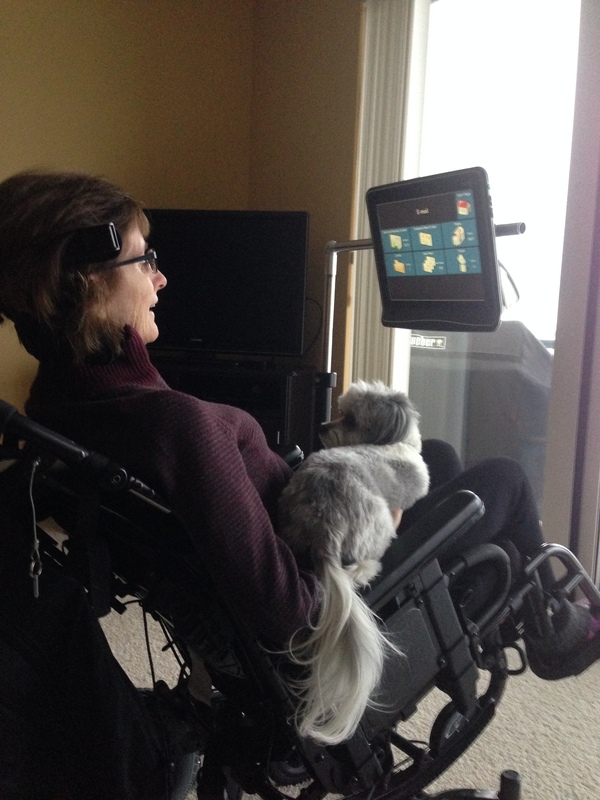 I enjoy reading it and while I have had the opportunity to meet with many individuals with ALS, specifically ones who use tobii or other devices, I think your blog has showed me a side of ALS that I was unable to encounter in graduate school. Thank you for that. You are in my prayers always. You are a blessing so so many! Hugs on this cold winter day!! I am so excited for our next visit when we can really chat again. I love you, Rosemary! Hi Rosemary. It’s Sandy Sirianni. I miss how you made the rounds upstairs at Greenridge Realty when we both worked in that building. Always happy even though I’m sure you weren’t always happy. Or maybe you were! And you are still happy. I must say I am happiest when I’m in a chair snuggled with my dog. And typing with your eyes. Wow! You are blessed! And we are all blessed to know you. Thank you and your family for sharing. Your son Cory’s Christmas Day post was the best. That photo….priceless. Rosemary, you and I have meet a few times years ago in the real estate world. I have been blessed by your tenacity and sunny disposition regardless of ALS. You are a champion, please continue to inspire! I would love to have your email address, to exchange thoughts and your in site as I have younger children and I can see you and Mike have raised a wonderful family. Thanks for sharing this experience. I never would have dreamed of this technology, and it’s wonderful that you are able to express yourself through all these challenges!! Thanks, Rosemary, for sharing your life with us!! Mark also! and all your family!! Oh how WE love your blogs – by WE I mean Stub, Brenda, Tammy and Kelly. You could make a fortune as a writer! Rosemary I can’t begin to comprehend and understand what you are going through. As you have heard from many though, you are an inspiration. I don’t know if that helps you cope in any way but you have taken something horrible and your true character has shown through to make the best of it. God bless you! Wonderful machine, Rosemary! So happy you are able to still communicate and be able to say “ALS stinks!” Get the machine talking for you and let it rip! Love the picture–I can see the animation in your face. Your blog is so inspirational. What a wonderful way to be able to communicate all that you are going through. I just have to say – I love that you “puppy” helps you with your Tobil. Pets are such a great comfort. We are happy that you have Tobii and so glad it can bring you joy. Don’t know what we would do without your wonderful inspiring words and thoughts. Love you!!! You are so wonderful. Thank you for being you. I’m not Anonymous, I’m Bill Tripp! If it can be done, I believe you can do it!